A bereaved daughter fights to keep her local community centre open. A vicar finds the strength to leave her abusive husband. A transgender teen’s family tries to come to terms with her transition. A shiny new Swedish furniture store is just about to open, and a family of Syrian refugees are travelling towards Sheffield, the city where all this is happening. 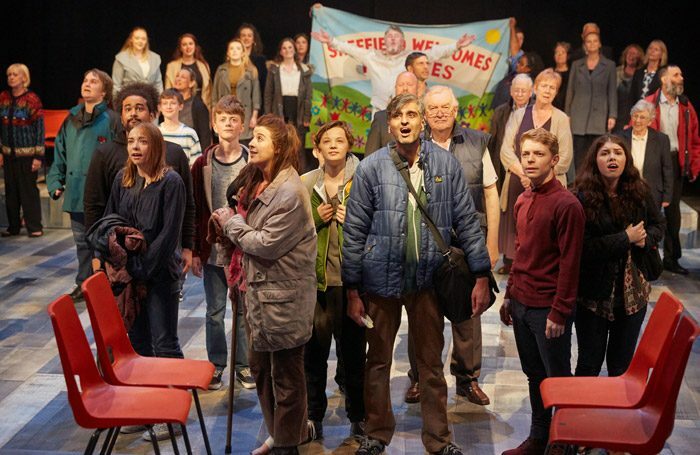 These stories, based on interviews with local residents, intertwined and brought to life for Songs From The Seven Hills, the latest Sheffield People’s Theatre production at the Crucible. They’re cleverly linked together by the ghost of a recently deceased steelworker, who slowly reveals how all the characters are linked together. John Hollingworth’s script is heartfelt and witty, while avoiding sentimentality, and Scott Gilmour and Claire McKenzie’s songs are reminiscent of the score for Everybody’s Talking About Jamie – catchy and intelligent. At times, the scale threatens to become a bit overwhelming, and the narrative loses focus – but the production’s heart keeps things together. As with any community project, the acting among the 50-strong ensemble varies in quality, but what they all have in common is a rare passion and enthusiasm that radiates off the stage. Like the city itself, there’s nothing too flashy or showy about Songs from the Seven Hills. Rather, its power lies in illuminating the beauty in the mundane, and the poetry in the everyday. It’s that which gives this production its warm glow.